Kaprun may be the smaller neighbour of the bustling resort of Zell am See, but the altitude and skiing conditions of its slopes are a match for the better-known town next door. The Kitzsteinhorn and its glacier offer a good range of challenging ski runs on snow-sure mountains with a decent amount of off-piste options, while the smaller "village hill" area of the Maiskogel offers a range of easy blue runs close at hand to the accommodation. 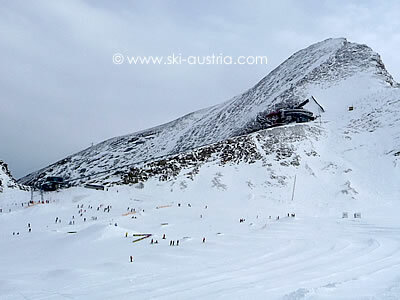 Kaprun's main ski area - the Kitzsteinhorn glacier skiing - is located above the village about ten minutes' drive along the road in the direction of the dam and reservoir. The base station car parks have a shuttle system to take people from their cars to the various lifts and there is a regular ski bus service from the village centre. 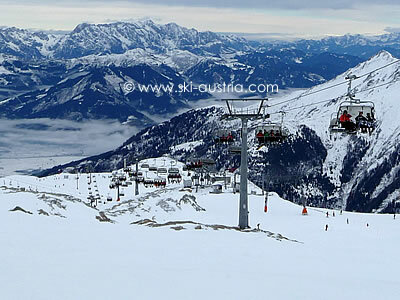 Two gondolas provide access to the skiing, which starts at just under 2000 metres in altitude. 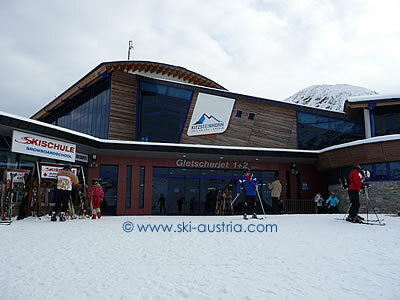 The Gletscherjet I and the slightly elevated Panoramabahn both allow exit at the intermediate Langwied station, where there are opportunities for ski hire and refreshments, or the opportunity to take the Gletscherjet II gondola or the Langwied chairlift higher. Getting off the lifts deposits the skier in the main vortex of the ski area. Off to the left is the cable car heading up to the highest point of the area at 3029m - the Gipfelbahn. According to some sources, it's the highest cable car (above the ground) in the world. If conditions are good, there's a short black run down from the top to the easy glacier draglifts (used for summer skiing) - otherwise a mountain funicular takes skiers the short drop to the main slopes. There is also a rock tunnel through to the viewpoint with a panorama out onto Austria's highest mountain, the Grossglockner. Traversing around the beginner lifts at the top and back under the cable car, the Schmiedinger draglifts are reached. These are longer than they look on the official ski map and offer some of the most pleasant challenging skiing on the Kitzsteinhorn. Looking up, on the right there is a narrow-ish bump run, whle off to the left is a groomed red run, then a training area, and finally an off-piste route which eventually leads down to the base of the Sonnenkar chairlifts. The chair on the left leads back through to the Schmiedinger area and also provides access to the easy intermediate areas encompassed in the area around the Kitz and Kees draglifts. Although often crowded, these are perfect runs to test out intermediate form on undemanding slopes. Descending from this area leads to an often-crowded run which eventually heads down to the main ski centre and the top of the gondolas. There are options away from this busy route, however. The top of the second Sonnenkar chairlift is the sign for a pleasant red gully down to the junction of the two chairlifts (see description of other one above), while there is also an option to head way over to the left and descend on another red to the bottom of the Kristallbahn chairlift. It is possible to descend on the gondolas from the central station, or to take an off-piste route or a sometimes busy red run down to the Langwied area and join one of the two gondolas to the base station. 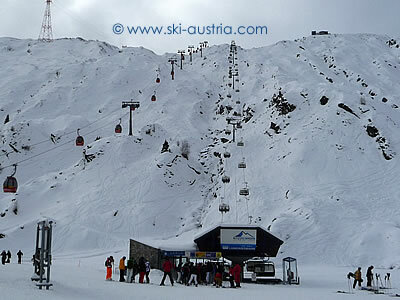 * It should be noted that one of the main attractions of the Kitzsteinhorn ski area for good skiers is the option of skiing off-piste in gullies and the ungroomed areas between the lifts. It is not really possible (or advisable) to give an accurate idea of the scope of the off-piste in this short description - those who are unfamiliar with the area should take local advice about conditions and/or consider hiring a local guide/instructor. Remember as well that this is a glacier area and that there is a danger of crevasses. 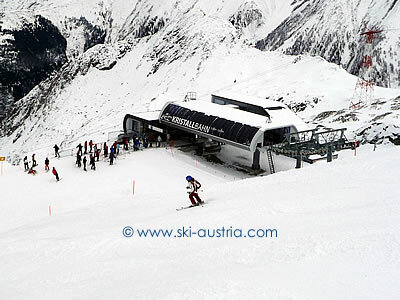 Kaprun's other ski area is the Maiskogel, reached either by the Schaufelberg chairlift from the village or from the Maiskogel cable car which is reached just above Kaprun on the road to the Kitzsteinhorn. 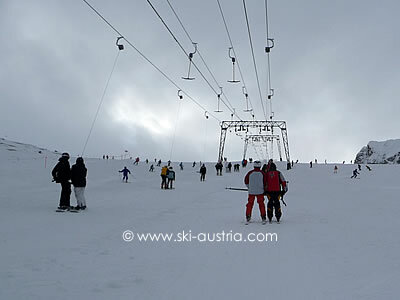 the Maiskogel consists mainly of blue runs, although there is a black run from the top chairlift. The live webcam stream below is taken from above the main Alpincenter area at Kaprun. There are other webcams for the Kaprun area available by clicking the middle button above the live stream.